Established in 1989, Swiftdeer-Paige, an earth friendly company, has been "edutaining" thousands of people young and old throughout the country on the important ecological issues of our times. Offering age appropriate programs for all seasons, Swiftdeer-Paige is strongly committed to inspiring a greater desire for a more balanced relationship with the web of life. Making his new home in the wild and scenic foothills of Conifer, CO, Swiftdeer continues to live every day as if the earth matters building a rich heritage of indigenous stories to entertain and enlighten audiences toward a caring and wiser relationship with nature. Dennis Paige has been awarded the 2008 Grassroots Conservation Leadership Award from the Audubon-Chicago Region and the Chicago Wilderness Habitat Project. This award reminds people that so many of us have a profound love for nature and that this love inspires us to do extraordinary things. With close ties to the earth, native North American cultures are a crucial link between human society and nature. The flute playing, circle dances, animal impressions, stories, songs, drumming, and sharing of the Medicine bag are presented in a very colorfully captivating setting, creating an inspirational program to draw the participant into the humor and ancient wisdom of the First Nations. Tailored to meet the needs of the individual group, this engaging 50 minute performance is available any time during the year. Ideal for scout gatherings, summer camps, school/library special events, festivals, and birthday parties. Coyote Awakenings This hour long program celebrates the return of the coyote to our area. Play a lively audience participatory game to learn how coyotes survive in the modern world, listen to a whimsical Okanagan-Salish tale about how the "Spirit chief" gave coyote his name. sing along to a coyote friendly full version to "Home On The Range" accompanied by harmonica, and then be enthralled to hear an amazing true story of how Swiftdeer was saved by a coyote and her pup in the rugged high desert wilderness of north central New Mexico. Spinning Earth Friendly Yarn for Kid's Sake – Where can you find the nearest storyteller? The answer may be closer than you think. Dennis Paige believes we are all born with the ability to tell stories, and that each of our lives is filled with a rich treasure of life experiences though we live in a fast paced electronic age that doesn't nurture those gifts. A naturalist, writer, and professional storyteller, Dennis guides children in creating, telling, and listening to tales with the wild world in mind and stories of personal connections with nature. Activities over a two hour workshop period will help provide the necessary tools for kids to enjoy the art of storytelling with an earth friendly twist to their schools, family, friends, or even their pet animals. Awakening The Hidden Storyteller As If the Earth Mattered – Where can you find the nearest storyteller? The answer may be closer than you think. We are all born with the innate ability to tell stories, though we live in a fast-paced electronic age that doesn't nurture the those gifts of life. Activities in this 2 to 3 hours earth friendly workshop provide the basic necessary tools for educators, eco-questers, parents and grandparents to enjoy the art of storytelling for their audience while integrating creative collaborative exercises which embrace nature in our lives. 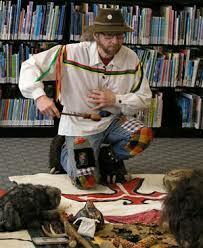 Come and explore an enchanting window into your inner child with long time eco-storyteller Dennis Swiftdeer Paige.